Wichita North junior Joe Williams saw ample time as a freshman for the Redskins. He missed his sophomore year for non-football related reasons. Last spring, coach Scott Moshier saw a change in Williams about halfway through track season. “This is something he really wanted to work at and wanted to do and just bought in 100 percent,” Moshier said. Williams had 95 percent attendance in summer weights. He has made good choices on and off the field and taken on a leadership role as the team’s tailback. Keyed by the improvements, Williams has emerged as one of Kansas’ breakout stars for arguably the state’s most surprising team. In Week 1, Wichita North won at Wichita South, 29-22, and halted a 21-game losing streak. Williams finished with 28 carries for 300 rushing yards, including a 98-yard run. Last week, the Redskins held on late for a 13-6 road victory against Liberal. North has started 2-0 and is part of large group of teams that captured wins in the first two weeks after struggling in past years. The Redskins already have their most wins in a season since a 2-7 mark in ’09 and earned back-to-back victories for the first time since a 7-2 record in ’03. Last Friday, Williams delivered 28 carries for 183 yards and a TD. He leads the state with 483 rushing yards. The team arrived back in Wichita after 2 a.m.
Williams and another senior had signed up to be a line judge at a North freshman volleyball tournament that started at 9 a.m. Moshier was impressed that the two players showed up on time Saturday morning and helped the school. “That’s just part of the character development of not only Joe, but I feel how our team is coming along,” Moshier said. Last week, North led Liberal, 13-0, before LHS scored with 10 seconds left. Liberal recovered an onside kick but the Redskins prevailed and limited Liberal to under 210 yards of total offense. Last season, North permitted 55.7 points a contest and scored just nine a game, both worst in Class 6A. Moshier, who played on the 1982 Wichita East state title team and graduated in ‘83, is in his 28th season as head coach. That includes stops at Oxford, Wellington, Hoxie, Belle Plaine and most notably Meade, where he installed the unbalanced single wing offense and captured two Class 2-1A state titles before he moved back to Wichita. Moshier’s son, Jordan, a former Tabor College linebacker, serves as the defensive coordinator. The two work side-by-side in North’s P.E. and weights. Lori Moshier, Scott’s wife, works a floor above leading the business department. North went to a 3-4 defense, a similar scheme to Meade. Scott continues to call the offense. North has averaged 297 rushing yards a game and rushed on 93 percent of plays. Senior wide receiver Chris Zaricki has caught both of the team’s passes for 27 yards and a score. North is known for quick kicks. Zaricki and senior Tayton Jenkins have combined for 11 punts with a 37-yard average and four inside the opponents’ 20-yard line. In Kansas, North is No. 12 in punt average and top-20 in rushing yards per game, according to MaxPreps statewide lists. North has well over 2,000 students, and Moshier has faced some challenges he never had at Meade. The Redskins have around 50-60 football players before school starts. Then, the first day of school comes. North has around 20 freshmen on the roster. Before the freshmen contest, the coaches asked how many players had never played football before. Moshier said “eight to 10 kids” raised their hand. However, North had 90 different kids in summer weights and had great commitment. Every coach coaches both sides of the ball. While North has 97 players on the roster and multiple players start both ways, rare for a 6A school. Coaches Quinton Burgess and Lorne Williams lead the defensive line, a unit that uses six to seven players. Senior Thomas Kucera, a team captain, starts at center and nose guard. Seniors Jacob Bagby and Tjayden Barnes, both at tight end, rotate in at the defensive line. Sophomore Britt Bishop has played up front. Senior Manny Aguilar, a move-in, has stepped in at outside tackle, and senior Spencer Woods has played tackle/guard. “There’s probably three or four of those kids that have to play on offense,” Moshier said. Five to six linebackers see time. Junior Silas Marcos Quintero paces the squad with 20 tackles, and junior Josiah Barnes has 10 stops. In the secondary, junior Angel Martinez ruptured a thumb tendon before the first game and is out for the year. First-year Leoti-Wichita County coach Brant Douglas went to high school at Cheyenne (Wyo.) Central. He played collegiately at University of Nebraska-Kearney. Douglas learned and watched the spread offense with the Lopers. Then, he coached one year in Houston and two years in Sidney, Neb. Last fall, Douglas served as the co-offensive coordinator and implemented some spread concepts. Sidney is the headquarters for Cabela’s, where his wife, Haylie, worked. Bass Pro Shops bought out Cabela’s, and Haylie needed a job and wanted to move closer to family. Haylie is from Tribune, just over 20 miles due west from Leoti. The couple moved back to Tribune. Haylie took a job in the office at Western Electric, and Douglas became the Wichita County head football coach. He changed the offense from the option to the spread and has achieved great early success. The Indians, in its third year of eight-man football, won its season opener for the first time since 2011 with a 66-8 neutral site victory against Pretty Prairie at Otis-Bison. Then, Leoti beat Sharon Springs-Wallace County, 54-6, in the home opener. Wichita County is 2-0 for the first time since at least before ’04. Fans told Douglas the home atmosphere last Friday marked the best for the Indians in years. Leoti played a significant number of freshmen in 2017 and returned 94 percent of its tackles. Douglas has been very pleased with senior nose guard Jesse Hermosillo, the team’s leading tackler with 11 stops. Hermosillo has clogged holes and wreaked havoc up the middle. Douglas credited assistant coach Hayden Parks for weight room work and building depth. Senior linebacker Ronald Michel, last year’s leading tackler, is second with 10 stops. He played limited snaps in the season opener due to an injury in preseason. Michel, the starting quarterback most of last fall, has become a key Swiss Army Knife-type offensive player. He has played tight end, fullback and wide receiver. “He’s really a coach on the field for us, and kids really respect him and listen to him,” Douglas said. Sophomore quarterback Kayde Rietzke has significantly improved the passing game with 17 of 20 for 276 yards with seven scores against no interceptions. He leads the team with 21 carries for 209 yards and five scores. In ’17, Rietzke suffered a season-ending injury in the preseason Red and White scrimmage and didn’t play. Wichita County finished with 23 percent completion for 353 yards with a 7/6 TD/INT ratio. Douglas labels Rietzke “a student of the game” who watches extensive college and pro film. Leoti’s offense involves significant reading, and Rietzke knows when to hand the ball off and when to pull it from the back’s stomach. Sophomore Sheldon Whalen has six catches for 139 yards and three scores. Whalen and sophomore Teagan Bishop have played well at safety. “He came to me pretty football smart, and we’ve just been working on developing the small things that he needs to work on, and he’s really taken to that pretty well,” Douglas said of Rietzke. Last fall, Chapman opened the Kurt Webster era with a 1-8 record. The Fighting Irish lost one contest by two and a pair by one point apiece. Chapman’s five biggest players in ’17 were non-seniors. The Stroud brothers, Kobey and Kel, were the team’s heaviest at 230 pounds. Kobey, as a junior, collected first team all-league. Kobey, now 5-foot-11, 230 pounds, starts at right tackle, while Kel is the right guard at 6-2, 240. Junior center Zach Ferris (5-6, 176), a good wrestler, has graded out very high through the first two weeks. Senior left guard Erik Woodbury is a two-year starter and 4.0 student. In Webster’s eyes, has Woodbury “completely transformed” his 6-0, 215-pound body through the weight room in the last nine months. “Tremendous amount of size there that came back,” Webster said. The returning lineman and weight room work has keyed a 2-0 start for the Irish with North Central Kansas League victories against Marysville (34-18) and Wamego (22-8). “The offensive line has been incredible this year,” Webster, a former Shawnee Mission West assistant, said. Chapman had dropped three straight to Marysville and 11 in a row to Wamego. Chapman is 2-0 for the first time since ’15 and has not had a winning season since a 7-3 mark in ’07. Community members have asked Webster the differences between last fall and this year. Webster said there’s little difference. The team has maintained course after the close losses. Webster believed the difference would come in the “little things,” like the weight room and fundamentals. In the year before he came, Webster said Chapman had 12 players reach 80 percent in summer weight room attendance. Last summer, 33 players made 80 percent, and the Irish has multiple 300-pound squatters and cleaners. Kobey Stroud has a 300-pound clean, a 425-pound squat and 330 bench. Webster believes Kel Stroud, with his size and length, has the body type college coaches like. Webster’s Wing T offense and style is very similar to Shawnee Mission West and longtime coach Tim Callaghan. He has learned to change his demeanor this year, an area he learned from his former coach. “If you are going to expect your players to be level-headed and calm, that’s what you have to present and that’s one of the biggest things,” Webster said. Senior quarterback Izek Jackson is 6-5, 185 pounds and cleans 275. Last year, he passed for 367 yards with 487 rushing and 11 offensive TDs accounted for. This fall, Chapman has ran the ball on 92 of 96 snaps. He has 41 carries for 368 yards and six scores. Senior Dalton Harvey led with 813 rushing yards and 91 tackles in ’17. He has 205 rushing yards and pair of scores and leads the team with 11 stops and three sacks this fall. Webster said Harvey is “such a different player” than when the coach arrived two years ago. Seniors Brandon Colston, Blake Vercher, and Anthony Wasylk have played well defensively with 17 combined tackles. Chapman has another opportunity to end a long losing streak this Friday when it plays longtime rival Abilene. The Irish has lost five straight to the Cowboys and 10 of the last 11. The rivalry started in 1892 and is the longest west of the Mississippi River. While many of this year’s surprise 2-0 teams come with first- and second-year coaches, Minneapolis has Jhon Haehn, in his fifth fall with the Lions. Haehn had instant success with an 8-4 mark and run to the Class 3A quarterfinals in ’14, tied for the best finish in school history. Then, Minneapolis went 0-9, 1-8 and 2-7 the last three years. Several of the current seniors, including lineman Gaton Heald and running back/linebacker Tristin Hauck, played as freshmen. In the offseason, Haehn attended multiple clinics and learned more about the mental aspect of football. “When you get a losing culture going where I think mentally people get used to something, and then it’s like, ‘OK, here we go again, and I am terrible, and I can’t do this,’” Haehn said. He read “The Champion’s Mind,” a more recent book, and “What to Say When You Talk to Your Self,” a book first published in 1986. This fall, Rule 10 assistant Todd Just, a former football player and Minneapolis minister, joined the staff and has helped teach the team different situations in football and life, such as coming together as a team, respecting others and taking personal responsibility. “You’ve got to consistently talk about it, consistently drill it into the kids just like you do your veer path,” Haehn said. Minneapolis spent ample time in the summer and, with Kansas changing its practice scheduling this fall, much of the first week of practice on its mentality. “Talked about how to be mentally tougher, talked about what champions do to prepare, and what mindset you need, how you get focused,” Haehn said. The improvements have yielded a 2-0 start with a 46-8 win against Republic County and a 20-17 overtime victory versus Sacred Heart. The Knights had scored first in overtime on a field goal before senior Derek Freel threw a touchdown pass to junior Kaden Griffin. Freel started two games and learned to run the option last year. He won a three-way quarterback battle and has zero turnovers in the option and not thrown an interception. “The main reason we chose him is because he manages the game really well, he reads the option well, and he throws a pretty good fade ball,” Haehn said. Sophomore Trent Moeckel and senior Kaden McCullick were also in competition at quarterback. Moeckel and senior Derek Pieschl has played well at defensive back, while McCullick has been solid on both sides, including defensive line. McCullick is part of a balanced backfield that includes 5-7, 200-pound senior fullback Tyson Villalpando. Villalpando can squat 450 and bench 275. Haehn estimated Villalpando had 16 to 17 tackles last Friday and ran hard in the flexbone. “I don’t think the first guy tackled him all night,” Haehn said. Heald starts at right tackle, and Haehn labeled him “by far” the team’s best lineman. Left guard has featured two freshmen, Gannon Cleveland and Chasyn Vogan, that have pleased Haehn. Both players are JV running backs and will likely play the backfield in the future. This season, Minneapolis had trouble filling the position, and Haehn asked the duo to switch off. After successful playoffs runs in basketball and baseball earlier this year, it was evident that Parsons had the talent to be successful, but whether that would transition to victories on the football field was yet to be seen. Friess, a Parsons graduate and local elementary school principal, has stepped in and led the Vikings to a 2-0 start. The Vikings opened the season with over Iola (49-14) and Anderson County (39-14). The Anderson County victory came on Monday of this week after the game was postponed from last Friday due to flooding in Garnett. Friess is the fourth head coach in the past six seasons at Parsons. He inherited a program that had won a total of five games in the previous six seasons. In the past ten years, Parsons football has posted a 16-75 record with nearly half of those victories coming in the 2011 season in which the Vikings finished 7-3 and reached the first round of the Class 4A playoffs. But if this team seems different, its likely due to a roster that includes some of the state’s top athletes. Juniors DaQuan Johnson and Dariq Williams can create matchup problems for almost any opponent. Johnson, who played quarterback last fall, shares time behind center with starter Gage Friess. Through two games this season, Friess is the team’s leading rusher with 131 yards, while also completing nearly 70 percent of his passes for 327 yards and six touchdowns. Patch Loadholtz (156 yards, 3 TDs) and Davonte’ Yates (125 yards, 2 TDs) are the team’s leading receivers, while seven other players have caught passes in the Vikings’ first two games. If the Parsons offensive numbers through two games may not seem that impressive, consider the team has scored five times on defense and special teams in the first two weeks. Johnson returned an interception 99 yards in Week 1 and also has returned a punt for a touchdown. On Monday against Anderson County, Williams caught a touchdown pass, returned a fumble for a score, and returned a punt return for a touchdown. Williams has returned a punt for a touchdown in each of the first two games. Parsons has its home-opener tonight against Osawatomie; its third consecutive opponent from the Pioneer League. A longtime member of the Southeast Kansas League, Parsons declared its independence in football to schedule more similarly-sized opponents. 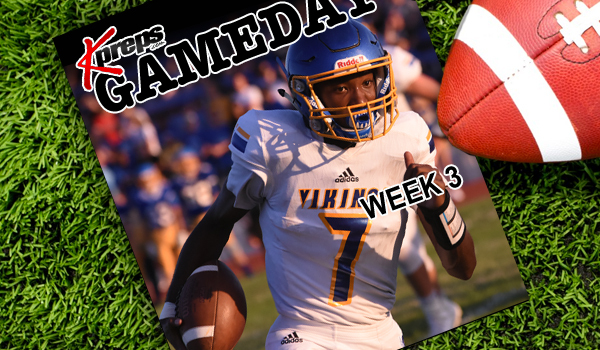 The Vikings hope to carry momentum into next week when they begin a challenging district that includes traditional contenders Caney Valley, Galena, Frontenac, and Columbus. Dustin Patee had served an assistant at Beloit/St. John’s-Tipton and head coach at Logan-Palco and Canton-Galva. Patee, known for his enthusiasm, enjoyed success at BSJT and L-P, but Canton-Galva proved not the best fit. Last year, Patee worked with behavioral disorder elementary students in Osborne. He looked at positions at nearby Lakeside-Downs and Lincoln. Patee took over Lincoln, which went 1-8 each of the last two years, and teaches PE/weights in the school district. This fall, Lincoln has opened with wins against Tescott (72-6) and Wilson (42-14). Patee said two areas “have made a big difference,” the buy-in from the players and defensive improvement. Patee had multiple Leopards show up in the summer who hadn’t previously come. Lincoln permitted 44.7 points per game last fall. Patee started the Blackshirts where the starting eight defenders get black Nike practice uniforms to practice in. He sets three defensive goals for each game: points allowed, turnover margin and special teams touchdowns scored and permitted. Yards don’t matter. So far, Lincoln has not scored or allowed a special teams score. The Leopards have won the turnover margin in each contest. This week, Lincoln plays host to Sylvan-Lucas (1-1) in the big Lincoln County rivalry. The Leopards have lost the last two games in the matchup. The Leopards have two seniors, quarterback Drew Biggs and lineman Logan Sneath, the starting center. Biggs, a captain, has completed 7 of 9 passes for 168 yards with four scores against no interceptions. He has rushed 37 times for 338 yards and seven TDs. Sophomore Tyler Good has 23 carries for 204 yards and four TDs. Lincoln has stressed blocking with all players, and has had strong blocking on the edge with freshmen Brayson Young, Joel Rees, sophomore Dillon Baxter and junior Zach Obermueller. Sophomore Kenton Myers drove a Wilson player 20 yards on one play. Good leads with 33 tackles, and Biggs has 25. Sophomore Landon O’Hare paces with seven TFLs. Last night, Shawnee Mission South improved to 3-0 with a 27-0 shutout of Lansing. Quarterback Jack Roberts tossed a pair of touchdown passes to junior Will Huggins to lead the South offense. The Raiders are beginning to turn things around under fourth-year head coach Brett Oberzan. South’s three wins already match last season’s total. The Raiders last four-win season came back in 2013, and South hasn’t posted five wins in a season in at least the past 15 years. In GWAC and Class 3A play, Colby has posted an 8-4 record under second-year coach Rees McKinney. The Eagles, led by senior back Jordan Schippers, went 6-4 last fall, its first season over .500 since a 7-3 record in 2009. Colby has defeated Ulysses, 43-20, and Hugoton, 35-6. Last season, the Eagles opened 4-0 before a 27-0 loss against Holcomb in Week 5. In the playoffs, the Longhorns defeated Colby, 46-15, in the first round of the playoffs en route to the Class 4A, Division II state title. Colby has lost nine straight games versus the Longhorns, all by at least double figure margins, dating back to 2010. The Eagles have scored just 63 points total in those contests. Holcomb (1-1) had significant graduation losses and took a big loss versus league power Scott City, ranked in the top-5 of Class 3A, last week. Senior running back Jayson Lambert has 24 carries for 121 yards and two scores. Senior Peyton Ortner has completed 15 of 26 passes for 135 yards with no scores against one interception. He has 19 carries for 95 yards. In Eight-Man, Division II, District 8, Stafford (2-0) travels to No. 5-ranked Otis-Bison (1-1) in a matchup with significant district ramifications. Stafford is off to its best start since it opened 8-0 in 2014. Since the start of 2015, Otis-Bison is 25-8, including 14-2 at home. The Cougars have captured 10 consecutive home victories dating back to a 40-28 loss to Central Plains in Week 3 of 2016, a game that came down to the final play. Otis-Bison’s losses have all been against quality teams. Two apiece came versus Victoria, Wallace County and Central Plains - all perennial powers – along with Dighton and Hodgeman County in ’16 and ’17. Those two squads both finished as Division II state runner-up in those respective years. This is the first matchup between the teams since Oct. 21, 2011, a 46-0 Cougar victory. Otis-Bison has won the last four meetings, all played between ’06-11. Three of the wins came by at least 38 points. Last season, Stafford averaged 43 passing and 154 rushing yards a game with 4.8 yards per play. The Trojans returned all of their positive rushing yards from ’17 and all of their 23 receptions. Senior Caleb Hildebrand had 127 carries for 920 yards and 14 scores, along with 140 tackles and 15 TFLs for a 4-5 squad. Stafford returned 91 percent of its tackles. This year, the Trojans average 85 passing and 127 rushing yards a contest with 6.5 yards per play. Senior Justice Manning has taken the offensive lead with 10 of 15 passing for 171 yards with five scores against no interceptions. He has 40 rushes for 204 yards and seven scores. For Otis-Bison, the Cougars bounced back from its opening week road loss to Victoria with a win against Bucklin. Quarterback Anton Foust was bothered by cramps versus the Knights but bounced back with a big performance last week. Another key district game in Eight-Man, Division II pits Central Christian traveling to South Barber. This matchup is likely to decide the two of the top spots in District 7. Both programs have been consistent winners in recent years. Central Christian has posted a 20-4 record since returning to the KSHSAA football ranks in 2016 after years as a club team. The Cougars have been known for their high-scoring offense in the past two seasons, but graduated standout quarterback Nate Heneha and linemen J.T. Duree. This season, the Cougars opened with a 44-16 loss against Argonia-Attica. It snapped a 12-game regular-season win streak for Central Christian. The Cougars then bounced back last week with a 50-0 blanking of Norwich to open district play. South Barber is coming off of consecutive 9-2 seasons in which they reached the state quarterfinals. This season, the Chieftains have opened with wins over Cherokee (Okla.) and Fairfield. Junior quarterback Trevor Rooks leads the South Barber offense, while senior Niel Gugelmeyer provides another solid option out of the backfield. Rooks has passed for 161 yards and three touchdowns and rushed for 153 more yards with three more scores through the first two weeks. Blue Valley North (0-2) at 4A No. 3 Pittsburg (2-0) – These two teams have taken different paths to get to this Week 3 matchup at Hutchinson Field in Pittsburg. Defending 6A champion Blue Valley North has began the season with losses to 4A No. 1 Bishop Miege (33-21) and 6A No. 3 Blue Valley (31-20). Meanwhile, Pittsburg has throttled former SEK League rivals Labette County (43-8) and Chanute (52-0). The Purple Dragon defense is talented, but will it be enough to slow down Mustang quarterback Graham Mertz? 6A No. 5 Manhattan (2-0) at Topeka Seaman (2-0) – Two of the three remaining unbeaten teams in the Centennial League will square off on Friday in Topeka. Manhattan is coming off of that controversial 21-20, overtime victory over Topeka High, while Seaman shutout rival Topeka Hayden 13-0 last week. Manhattan won last year’s meeting, 27-9, and have won five straight in the series. Seaman last defeated the Indians, 21-20, back in 2012. Emporia takes on Legend (Colorado) on Saturday in Scott City – Late this summer, Emporia was able to fill its Week 3 open date with Legend High School out of Parker, Colorado. The Spartans and Titans will meet on Saturday in Scott City. Legend is off to a 2-1 start to the season with an average scoring margin of 21.3 to 19.7. 5A No. 4 Mill Valley (2-0) at 4A No. 1 Bishop Miege (2-0) – Another key game in the Eastern Kansas League, Mill Valley will travel to Miege to try and dethrone the Stags. Miege has won 27 straight games and defeated Mill Valley 64-21 in 2016 and 54-21 last season. Battle for Salina: Salina Central (1-1) vs. Salina South (0-2) – The crosstown battle will take place on Friday night with the South Cougars still searching for their first win of the season. Salina Central snapped an 18-game losing streak with a dominating victory over Goddard-Eisenhower in Week 1 before falling at top-ranked Derby last week. Meanwhile, South was shut out at McPherson to open the season and fell 27-17 against Dodge City last week. Salina South has won seven straight in the series with Central last win coming 31-28 back in 2010. Christ Prep Academy (3-0) at 1A No. 4 Olpe (2-0 – Christ Prep, located in Lenexa, has been a popular opponent of small schools seeking to fill open dates for the past several years. The Patriots have played the likes of Valley Heights, Uniontown, McLouth in past years, and even made road trips to central Kansas to take on Medicine Lodge and Inman. In addition to Friday’s matchup at Olpe, the Patriots will travel to Troy and Jefferson County North in the coming weeks before hosting Coffeyville on October 20th. Christ Prep is 3-0 on the season having posted wins over Polo (Mo. ), University Academy (Mo. ), and Wabaunsee. The Patriots may prove as a test for Olpe in preparing the Eagles for a game against a solid Jackson Heights team next week. Cheylin (2-0) at Pawnee Heights (2-0) – Two of the four remaining unbeaten 6-man teams will meet on Friday in Rozel. Defending champion Pawnee Heights will try and extend its win streak to 12 games by slowing down Cheylin’s sophomore quarterback Colton McCarty. McCarty has accounted for 13 touchdowns in the Cougars’ first two games, including a 10-touchdown performance last week in a 74-43 victory over Rolla. KCAA Showdown: St. Mary’s Academy (1-0) vs. Wichita Homeschool (3-0) - The Kansas Christian Athletic Association (KCAA) title may be previewed again this Friday as St. Mary’s Academy takes on the Wichita Homeschool Warriors. St. Mary’s has won 18 straight games including a 60-38 win over the Warriors in the 2017 regular season, and a 40-14 victory over Wichita Homeschool in last year’s KCAA title game. St. Marys has opened with a 64-18 victory over Sunrise Christian Academy, while Wichita Homeschool has won 68-34 at Destiny Christian (Okla.) and posted home wins over Veritas Christian (49-0) and Cair Paravel (59-8). Junior Luke Johnson leads the Warrior offense with 250 rushing yards and five touchdowns this season. Junior quarterback Will Day has thrown for 612 yards and 11 touchdowns in the Warriors’ three wins.